ADL Signature Synagogues are a network of engaged congregations committed to fighting anti-Semitism and all forms of hate. Signature Synagogues will have direct access to ADL programs, resources and learning opportunities, creating a central location for community education and taking action. Members will become ambassadors for ADL at a critical time when standing up against anti-Semitism and hate is more important than ever. The Signature Synagogue program is designed to encourage congregation-wide commitment to raising awareness and speaking out against anti-Semitism and issues taking place locally. The program will activate members into long-term engagement with ADL, and will culminate with recognition for implementing the programmatic components listed below. 1. Nominate at least one ADL community liaison to serve a one-year term. The liaison(s) will be the main point of contact to ADL in addition to synagogue clergy and staff. Liaisons should be equipped to take on this responsibility in terms of availability and willingness to encourage participation in ADL activities at the synagogue. 2. Host at least one Words to Action (WTA) workshop. WTA workshops are interactive discussion-based programs focused on providing youth and young adults with a heightened understanding of historical and contemporary anti-Semitism. WTA programs are led by trained ADL facilitators, utilize realistic case studies of anti-Semitic incidents, and equip participants with effective tools for taking action. Programs are 1.5 -2 hours long and customized for all age groups. Click here to learn more about Words to Action. 3. Organize a “Never Is Now: Summit on Anti-Semitism & Hate” steering committee. ADL’s signature annual event, Never Is Now is a one-day conference focused on understanding contemporary drivers and dynamics of anti-Semitism. The steering committee can be comprised of volunteers who are activated and enthusiastic about sharing the mission and work of ADL and should strive to organize a delegation of 10+ members to attend Never Is Now. Signature Synagogue members receive an exclusive discounted ticket rate. Click here to learn more about Never is Now: The Summit on Anti-Semitism & Hate. 4. Hold a training on how to be an ADL Ambassador. This training will serve as “ADL 101” for the community. An ADL staff member will make a presentation on the core areas of ADL’s work, including education, research, policy, and advocacy and will emphasize ways volunteers can get involved. 5. Host an ADL Expert Speaker. Signature Synagogues should organize at least one program featuring an ADL Expert Speaker to provide detailed information about one specific topic. Presentations can focus on ADL’s Center on Extremism, Center for Technology & Society, International Affairs & Israel, Anti-Semitism global to local, or another topic of choice. Synagogues that sign on to participate in this program should be committed to fulfilling these responsibilities within a one-year period of time. Registering for the Signature Synagogue program involves an upfront gift to ADL of $750.00. These funds will cover the cost of every programmatic component of the Signature Synagogue initiative, including all ADL speaker and workshop honoraria. The fee can be attributed to ADL by the synagogue or underwritten by a member of the congregation. 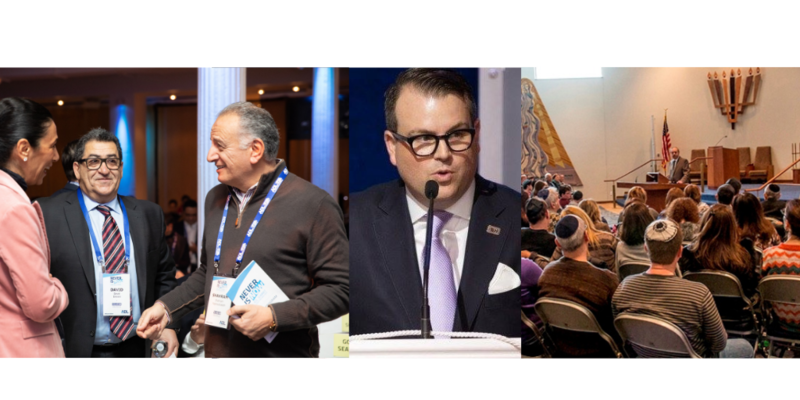 *Every member of each Signature Synagogue is granted an 18% discounted ticket rate for our annual Never Is Now Summit on Anti-Semitism & Hate, taking place at the Javits Center in New York City on November 21, 2019. Synagogues that complete these requirements will be granted an award at an annual recognition ceremony in the region. Please feel free to provide further details about your involvement with your synagogue and/or community. These funds will cover the cost of every programmatic component of the Signature Synagogue initiative, including all ADL speaker and workshop honoraria. Receiving more information about the Signature Synagogue Program. Registering my synagogue to implement this initiative. Taking on a leadership role with the Signature Synagogue program in my community. Please feel free to provide any additional information about your interest in this program.